But what awaited down the road was incredible.. A truly wow moment for a man like me… Gullfoss Falls, Iceland (Golden falls). Yes. It really is one of those ‘a photo doesn’t do it justice’ places. A huge 2 step falls that from whatever angle or distance gives an aura of magnificence. From the viewing platform high above you cannot see where the water goes due to the landscape giving it an extra dimension. Close up the spray cannot be avoided but that does not stop you capturing a private moment to thank for being here to view it. 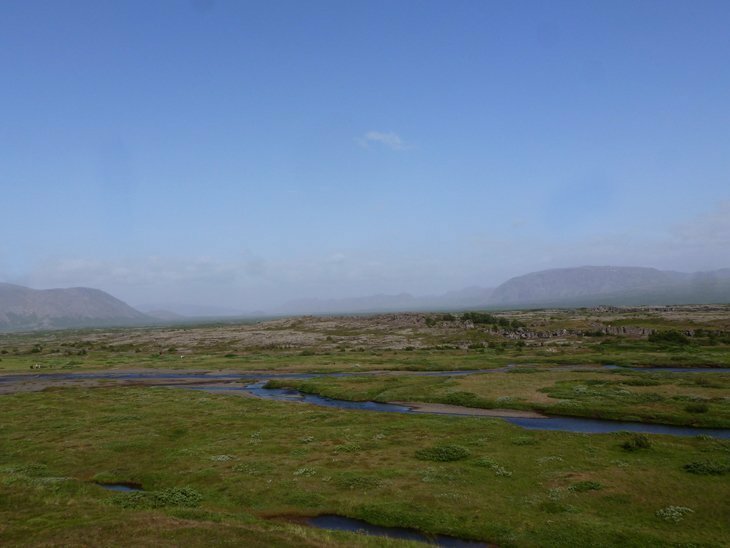 Only a few miles down the road from the falls is the Haukadalur geothermal area. Geysers and springs! 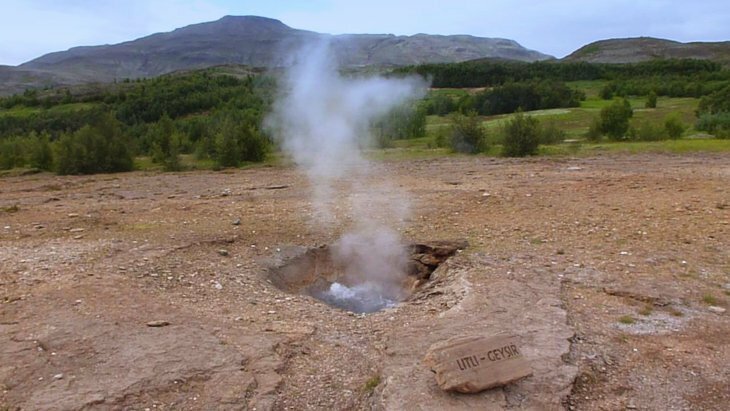 In fact our word Geyser comes from the largest one here Geysir. In the past it has reached a height of 170 metres, but alas it is currently dormant. But, right next to it is Strokkur, that erupts every 4 to 8 minutes with varying height up to 40 m. An amazing spectacle. 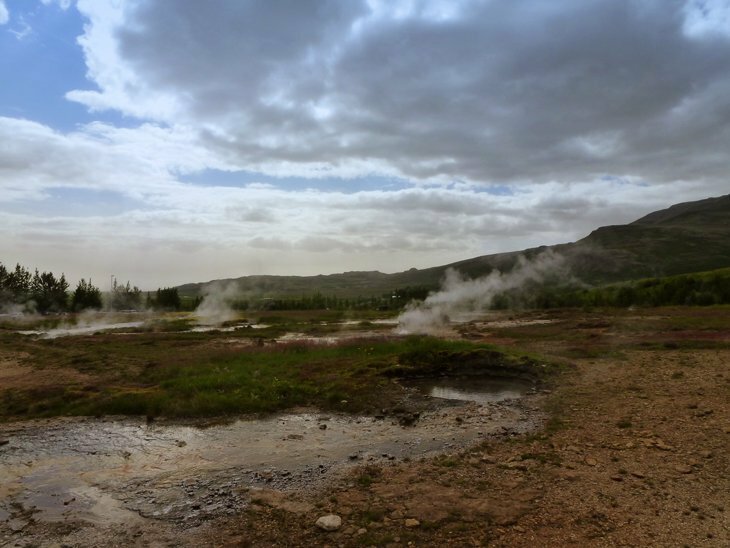 The whole area is surreal, as well as the geysers there are hot springs sending bubbling water and steam into the air. A reminder that the volcanic earth below is not too far away. 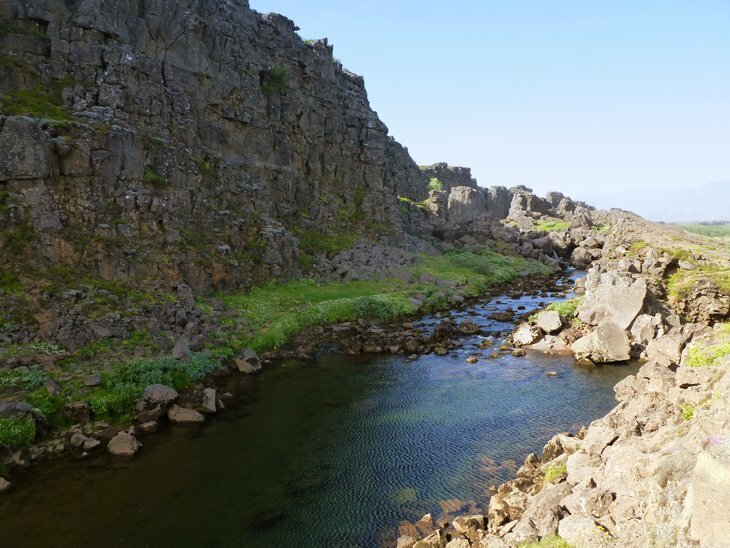 And so it was on to Thingvellir. So so much about this place to see and learn! 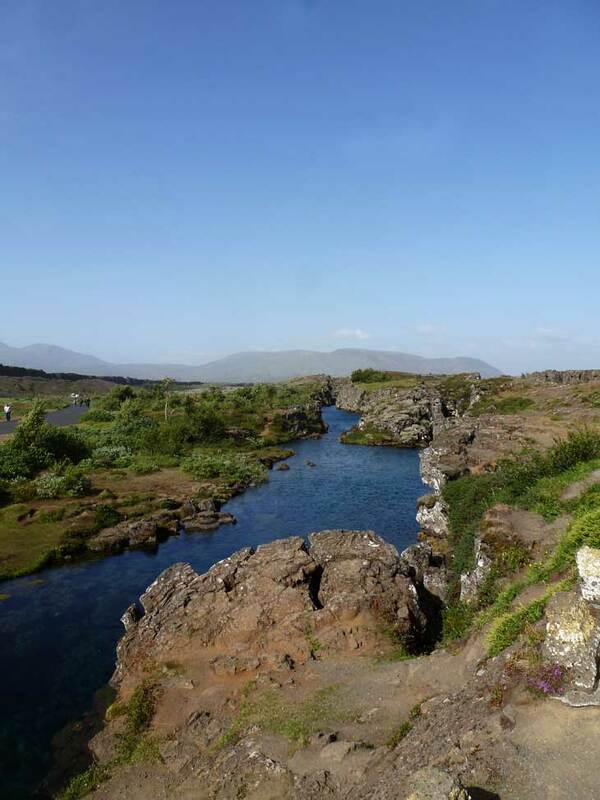 Ok, to start with it is the site of the rift between the North American and Eurasian tectonic plates. The cliff wall is a sure sign of this as it cuts through the land for miles and miles.To see above sea in this way brings the hugeness of nature and the earths workings home. In 930 AD this area was also used for one of the oldest parliaments in the world. In this area so far back laws were made and justice was given. To learn about how it developed the history of this great island and to wander it was great… And then to wander up to the top of the plate cliffs and look out. Wow! Thingvallavatn stretches out for miles before you too looking like the sea. This is the largest lake in Iceland. 85 sqaure km. Yes huge. Its origins due to the fissure, the water so so so clear. 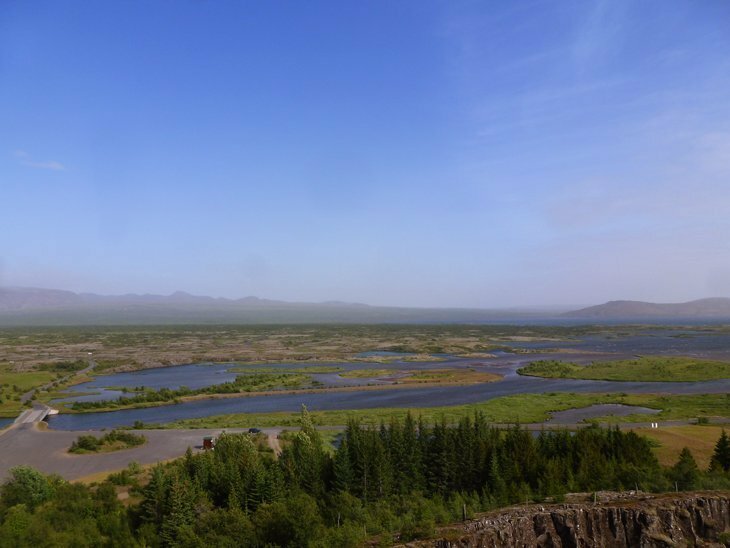 The cracks in the earths surface can be seen all around it and the geothermal effect apparently makes it a guessing game for anglers with the temperatures. Hi Paul. Recently I have had my desire to travel again, and seeing the places you travel to has been such an awesome motivation. Got any suggestions on traveling frugally? 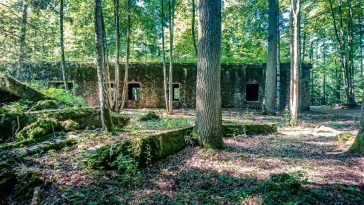 Cool and definitely a place to go – especially for nature lovers, like me! Till now I heard a lot of times that Island is very beautiful but truly expensive. 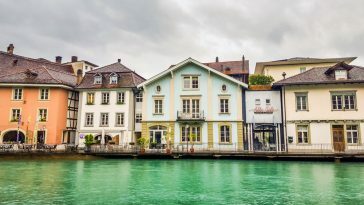 Do you think that traveling on the cheap is still possible? Thanks for the wonderful Iceland pictures. I am in that classic tourist dilemma of trying to fit in the many great places in Iceland and yet have ample time in each. 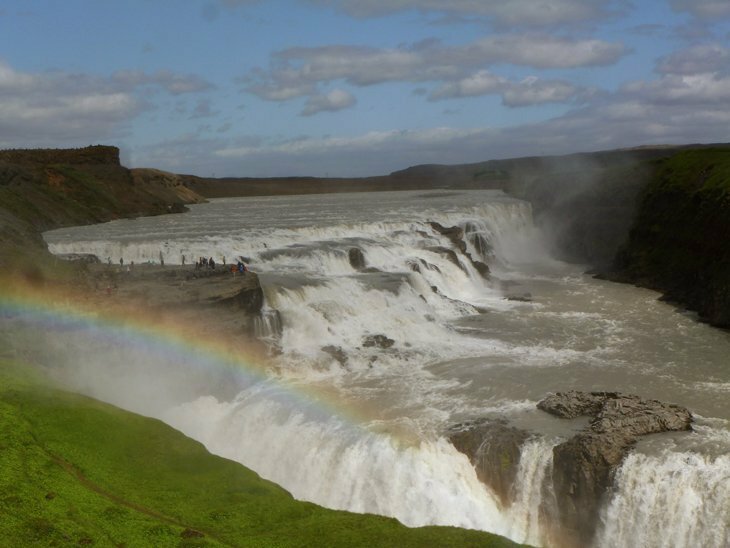 How long would you suggest spending in Gullfoss and Geysir? Did you go further east to Skaftafell or Jokulsarlon? Thanks. Hi Darren, this post was done from touring the 3 places comfortably in a day. From the capital it is one of the most common trips out, the triangle. You are lucky I really want to see the amazing water falls . Great pics, I was there 5 years ago and saw the same places, may have taken the same pictures. Iceland is an incredible place to visit, hike, tour, will never forget, and always hope to go back. Paul, what Discover the World trip are you on? Is it one of the walking tours they offer or one of your own? Beautiful pictures! Iceland is amazing. I was there twice last year for business-related stuff and had little time for touristing, so II really want to return for a couple of weeks just to ramble around and paint the scenery. 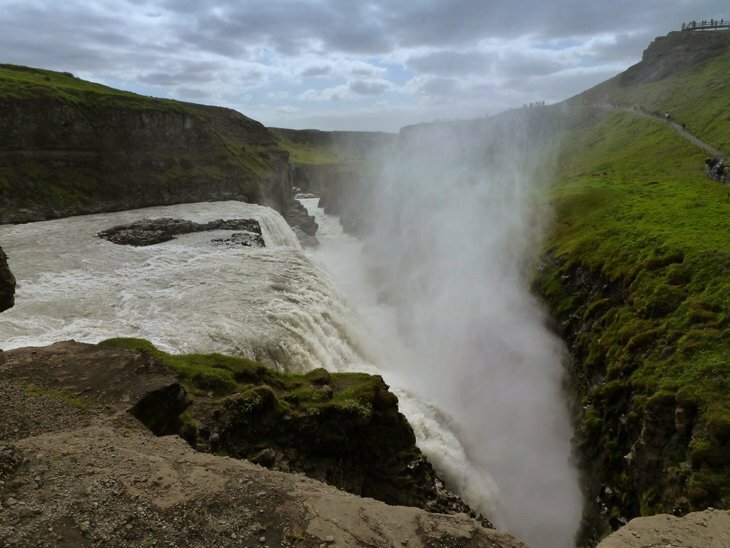 What amazed me about Gullfoss Falls was how you could walk right up and peer over that ledge directly into the rushing waters below…only a low cable around some edges to remind you not to fall in! I like this about Iceland, you really can get right up close and personal to all its natural beauty. Beautiful pictures – I feel like I was right there with you! 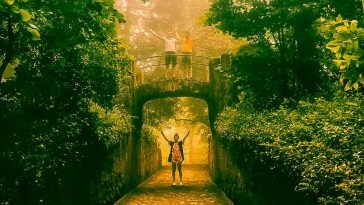 Thanks for sharing your travels with us this way – I always love looking at other peoples' travel footage – not that I don't have enough of my own! awesome pics. 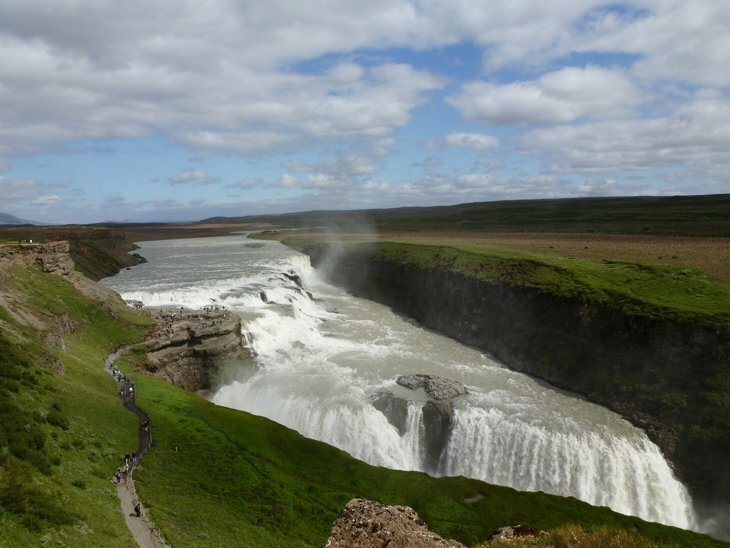 the first one of Gullfoss Falls is fantastic! the people in the photo really give you a good sense for how big the falls are. what a site to behold! enjoy the rest of your trip Paul! 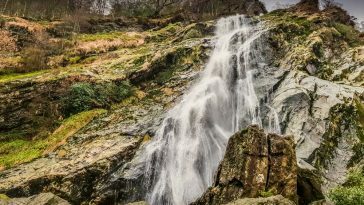 Fantastic photographs, looking forward to the waterproof camera shots – the list of places to visit and see seems to just grow and grow!